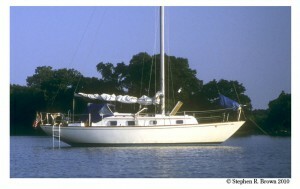 L’Escargot, now the nicest Bristol 32 on the Chesapeake Bay, is in the water and going fast (for a Bristol 32). I’d like to thank everyone who coordinated their efforts to get the boat through the yard: Buster Phipps for his innovative hatches and woodwork, Osprey Marine Composites for a smooth bottom and structural work, Atlantic Rigging for some smooth rigging work and to the man himself, Mike Cook who found the new engine, cleaned out the hull, restored some pumps and got the new engine running like a top. Lucy from the Herrington Harbour North offices ensured the boat got moved when necessary. I am looking forward to making some pictures and delivering books on the Bay this Summer. I am also looking forward to TIDEWATER: The Chesapeake Bay in Photographs book signings at the Marina. June 18, 2011 | Filed under Blogs, Photography, Tidewater and tagged with Chesapeake, Chesapeake Bay, Environment, family, fishing, John Smith Trail, photography, Tidewater, Travel.